Facelifts are plastic surgery procedures that offer natural-looking rejuvenation through a combination of restorative techniques. Specific cosmetic improvements may include returning facial features to a more youthful position, bringing back softness and fullness to the face, and addressing sagging skin and wrinkles. In recent years, younger patients have turned to facelift plastic surgery because it is a full-measure and a lasting approach to restoration rather than a maintenance treatment. Older patients in Manhattan and New York City continue to choose facelift surgery because it allows them to look their best without regular facial contouring and maintenance provided by injectables. Dr. Mark G. Albert is a top rated plastic surgeon and an expert in rejuvenating facial and neck features. He is a former fellow and now Director of Manhattan Eye, Ear, and Throat Hospital’s Aesthetic Surgery Fellowship Program. These roles have given him experience in nearly every cosmetic surgery technique and allow him to tailor procedures to individual goals. The most common reaction his former patients share is that they finally look the way that they feel—youthful and attractive—and that family and friends have no idea that they had surgery. Over time, features of the face and neck can begin to sag, lose volume and tone, and develop wrinkles. Patients may notice these changes even at an early age, and while there are many effective intermediary treatments for facial rejuvenation, many are temporary in nature. Facelifts offers our Manhattan and New York City patients effective, targeted, and long-term improvement. A well-performed surgery by one of the best plastic surgeons in NYC will transform an individual’s features to a younger state rather than radically changing one’s appearance. A toned and younger-looking neck, chin, and jaw. Smoother features and less prominent wrinkles and folds. Added volume in the upper face and cheeks. A higher brow and eyes that appear more rested and youthful (with the combination of facelift, brow lift, and blepharoplasty). Dr. Albert will place incisions in facial folds or areas hidden by hair, thus scars will be virtually invisible. This will keep your choice to have surgery as discrete as possible. During your initial consultation, you and Dr. Albert will discuss the factors that may be contributing to your aging appearance. You can also review before-and-after photos of to see how a facelift has improved these concerns for our other patients in the Manhattan and New York City areas. The surgical plan that Dr. Albert will recommend will take into account your aesthetic vision, medical history, and budget. Full facelift. Dr. Albert can conduct a procedure that restores your appearance from the top of your forehead to your clavicle. He will revise excess skin and reposition features to their more youthful state. His priority is to prevent the face from appearing unnaturally tight. He often uses fat grafting to create a soft, natural appearance. Upper or lower facelift. An upper facelift can give patients a smoother brow and younger-looking eyes. A lower facelift may eliminate unwanted fat and tighten the face’s underlying structure. This will give the cheeks, jowls, and neck a smooth, firm contour. PRP / Vampire Facelift®. This non-surgical approaches uses platelet-rich plasma that Dr. Albert is able to create from your own blood supply. PRP can stimulate collagen production for improved skin tone and texture. Dr. Albert also uses hyaluronic acid dermal fillers to add fullness to features. With each of these procedures, Dr. Albert will prioritize your safety, natural-looking rejuvenation, and your total satisfaction with the outcome. Depending on your treatment plan, your facelift will take place at either a New York City / Manhattan-area hospital or Dr. Albert’s office. Dr. Albert has extensive training in local anesthetic care, and you can expect to rest comfortably and safely throughout the procedure. Harvesting unwanted body fat and grafting it to facial features to increase fullness. Using erbium and CO2 medical lasers to firm up skin. Procedures that focus on the lower face and neck will generally take around three hours. 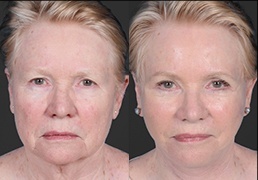 However, many facelift patients elect to have upper and lower eyelid surgery, brow lift, and related treatments. These additional measures by your plastic surgeon can extend surgery time up to five hours in total. After your facelift surgery, you will recuperate at Dr. Albert’s office or the surgical center for about two hours before going home. Some patients elect to have a private duty nurse at their home or hotel overnight. You will be scheduled to return within three days for a post-operative visit, during which your plastic surgeon, Dr. Albert, will make sure you are progressing well in your recovery and he will address any discomfort you may have. You will return one week after your procedure so that he can remove sutures. Usually, facelift patients in the choose to go back to normal activities around this time. After about 1.5 weeks from the date of the surgery, bruising and swelling should have reduced enough that you will begin to see a result similar to the final outcome of your procedure. Once fully recovered, you can expect to look like a younger version of yourself: familiar in appearance, but rejuvenated in a natural-looking and attractive way. If you are ready to restore your youthful features and reduce signs of aging, schedule a free consultation with Dr. Mark Albert. Patients seeking a plastic surgeon can contact his Manhattan/ New York City office online or by phone at (212) 203-8623.